Let me tell you about a teacher who really struggled with literacy centers. Every Thursday, she would write her lesson plans for the following week. When she started planning her centers, she made sure that they matched the skills and goals the class would be working on that week. But she often got stuck trying to plan the actual centers activities. She looked for ideas in teacher books. She flipped through her files and tried to remember what she did last year. She searched for activities online. Once she had *finally* chosen her centers activities, she printed, laminated, cut, and cut some more. On Friday, she did one or two of the activities with her small groups. Sometimes she modeled how to play a game with the whole class. When Monday came, she placed the materials in her centers. She explained ALL of the activities. That took a while, so the kids looked a bit glassy-eyed by the time she was finished. And when they went off to the centers? Well, sometimes the kids knew what to do. Sometimes they didn’t. Some students got off task because they were confused. Some kids ended up playing around or using the materials incorrectly. Centers time wasn’t terrible. But it wasn’t ideal. The kids weren’t getting as much out of centers as they could have been. Me! That teacher was me. 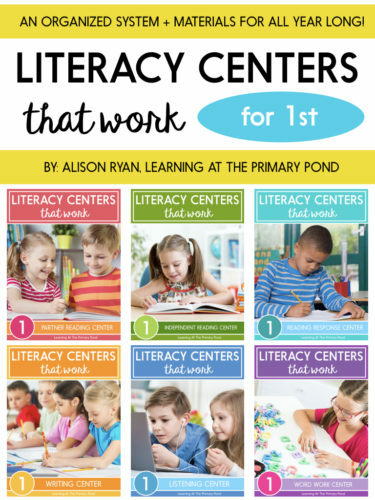 In today’s post, I’ll explain what was (in my opinion) my #1 biggest mistake in using this approach to plan and implement literacy centers. I’ll also share what I’ve learned to do instead! In my opinion, the biggest flaw in my (old) approach to centers was the lack of interconnectedness between my whole group instruction and small group instruction + centers. When I say that, I don’t mean that the instructional goals for whole-class and centers activities weren’t aligned. Because they were. Rather, I mean that I did not consistently incorporate activities in my whole-group and small-group instruction that I could later turn into centers. And, in turn, my centers activities did not directly come from what we did during whole group or small group. As you read at the beginning of this post, I would teach my kids how to play a game or do an activity once or twice. And then I’d add it to a center. But, as I explained, my kids forgot how to do the activities. They weren’t always engaged. They sometimes ended up playing around because they just weren’t familiar enough with what they were supposed to do. What I *needed* to do was consistently weave learning activities into whole and small group instruction. Then, students could later do the SAME (or very similar) activities during independent work or centers. During whole group shared reading, you are working with nursery rhymes. You read nursery rhymes and you talk about aspects of the print (i.e. sight words, initial letters, punctuation marks, etc.). Sometimes, you work with nursery rhymes on the interactive whiteboard or chart paper. And sometimes you have them written out on sentence strips, placed into a pocket chart. For two or three weeks, you do shared reading with several different nursery rhymes. During 3-4 of those shared reading lessons, you mix up the lines and model how you figure out how to put them back in order. You also have the class help you put the lines back in order. 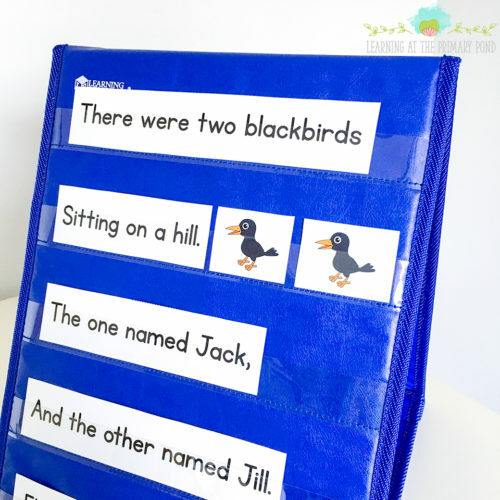 After those two or three weeks are up, you are ready to add a similar activity to a literacy center: students work in pairs to reread “complete” copies of familiar nursery rhymes, and then they put the lines of the rhymes (written on sentence strips) back in order. By this time, your kids have already had a lot of great practice! They have already chorally read the rhymes with the class. They’ve seen you model how to put them back in order (including think-alouds where you share your strategies). They’ve also participated in the activity — by telling you how to put them back in order, taking turns coming up to the pocket chart, etc. So when it’s time to teach them how to use the center, you really just have to quickly review the activity. You’ve already done the hard work! Now you can focus on basic procedures like where to find the materials, how to work cooperatively so that both partners have turns, etc. Even better? When you introduce this activity, it’s not going to take 20 minutes to model. Your kids aren’t going to get that glazed-over look. They KNOW this activity, and they’re excited to finally get to do it themselves! Do you see how, in this example, a center activity naturally grew out of whole class instruction? The kids see you model an activity multiple times. As a result, they are able to do the activity correctly (also increasing engagement!). You don’t have to rack your brain, trying to figure out what your center activities are going to be — the majority of them “grow” naturally out of what you’re doing in whole group and small group. You save time — instead of teaching “extra” activities for centers, most activities are already built into your whole group and small group instruction. Granted, this approach demands long-term planning, and that can be challenging. You can’t do the “oh-gosh-what-are-my-centers-going-to-be” panic dance on Friday afternoon when you’re getting materials out for the very next week. You always have to be a few weeks ahead. You have to thoroughly think through what you’re doing in whole and small group so that you will have centers activities ready a few weeks down the road. But, hey, this type of advance planning, while not always easy, can be GREAT for creating a cohesive instructional approach to your literacy block. What do you think? Could you tweak your whole-group and small-group instruction so that center activities grow out of them? Please share your thoughts in a comment! And if you’re looking to finally get ORGANIZED for literacy centers – so you can easily plan ahead in the way that I’ve described in this post – check out my Kindergarten, first, and second grade literacy centers bundles. They all have pre-made (but editable) planning calendars, so you can look ahead and thoroughly teach activities before you introduce them to centers. This makes amazing sense! 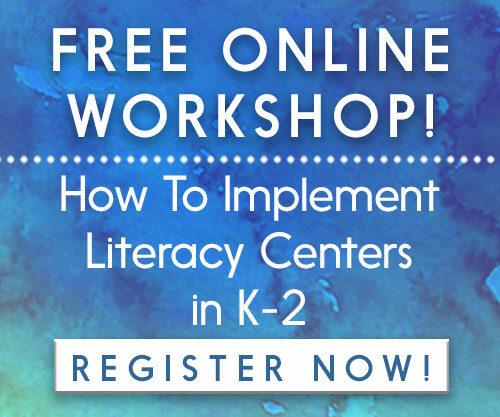 I am just getting back in to teaching after quite a few years and my brain is on overload trying to figure out how to organize my literacy centers. I love this idea! The flow and how you cut down on the “teaching new activities” time are so helpful! Same with me. I am going back to first grade and I too am on overload trying to figure out how to do it all. Thanks for all this help! This rings so true for me as I have made the same mistakes. Love your suggestion of how to model, teach, center activities in whole-group and small-group instruction before rolling them out as centers. Thanks! In our school, we have to differentiate each center. We may have 3 different levels in one group. Trying to wrap my mind around how to do this so everyone is engaged has been difficult. How would you differentiate with your center activities? Thanks. It’s so great to know I am not the only one experiencing the Friday afternoon panic, and glassy-eyed students on Monday morning. Thank you for the suggestions and tips. I will certainly plan on following them. Looking forward to the differentiation post. Thank you for sharing your struggle and your solution. It makes so much sense! I would like to know how do you do it at the beginning of the year with kinder? Im a bilingual first grade teacher . My biggest struggle is finding activities and or materials, especially books for shared reading and math worksheets, etc . In Spanish . Can you guide me somehow? Hi Suzie! TeachersPayTeachers is a great resource for bilingual activities. Scholastic has some bilingual materials, too. BookSource and ReallyGoodStuff are other websites that I love! I was just thinking this summer I need to rethink literacy centers. Thanks this a goos start.. This is great!! I will try this coming up school year. You really hit home with this post! So, I’m not going crazy! Thank you so much. I will be utilizing all of your suggestions. I tried to sign up for your email list but for some reason I am not receiving the link to confirm. I will try again. 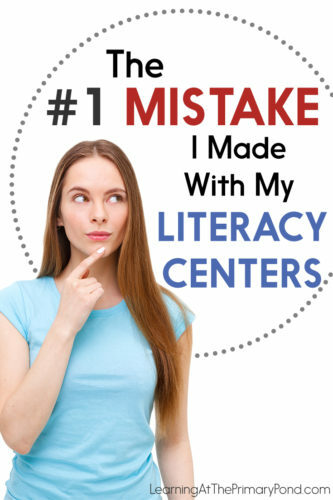 In your article “The #1 Mistake I Made with My Literacy Centers,” your solution makes so much sense. Have the students learn activities with the whole & small groups and then use the same activities in the Centers. Problem solved – I love how you strive to give students every chance for success!